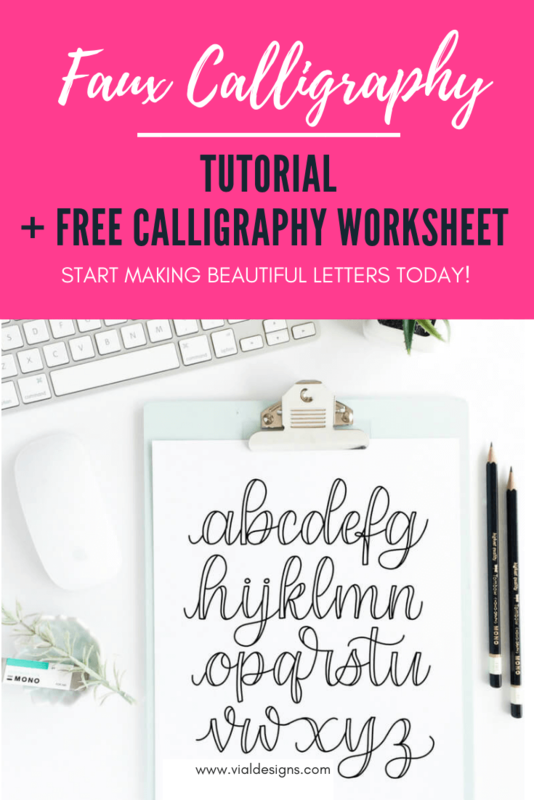 Faux Calligraphy Tutorial: How to start making beautiful letters TODAY! 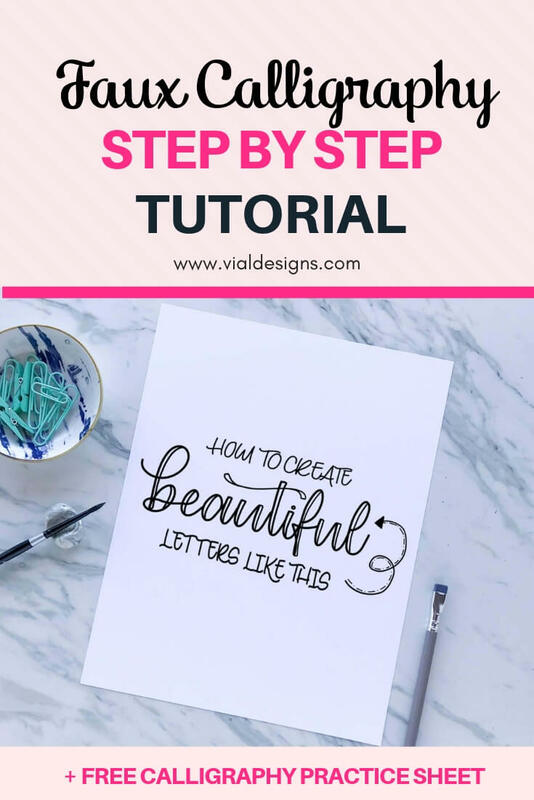 A simple and easy-to-follow tutorial to begin creating beautiful letters, aka, doing calligraphy without the need for any fancy tools or previous knowledge. 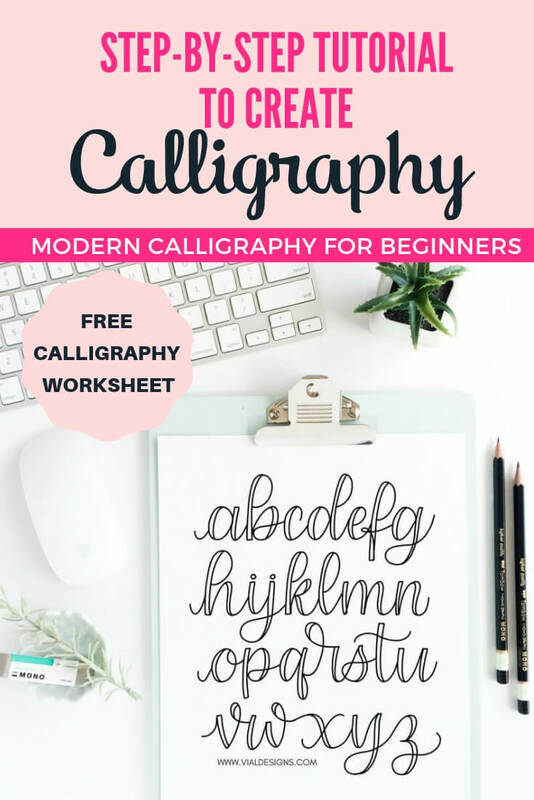 Plus get access to a FREE calligraphy worksheet so you can start practicing right away! I’m sure you have seen gorgeous calligraphy and might be thinking that only the lucky ones born with talent can create those beautiful letters. Well, I have good news for you. There is a way for you to start making beautiful letters TODAY! 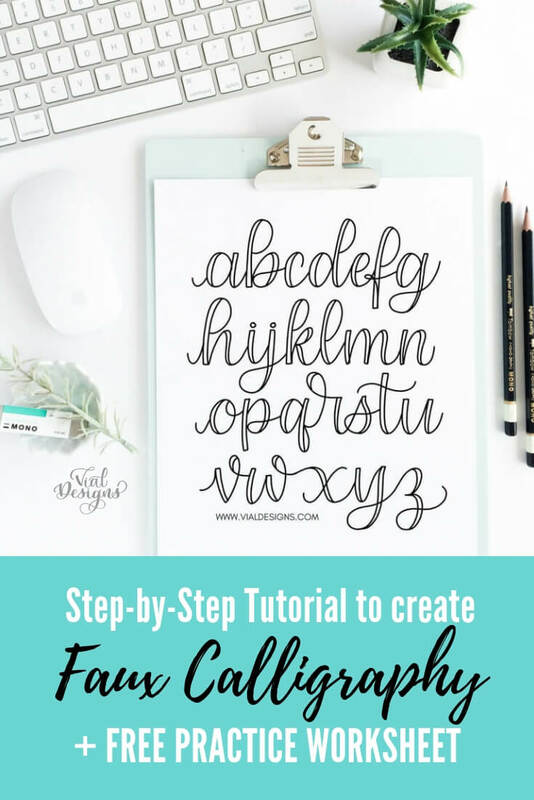 It’s called Faux Calligraphy, and I’m going to show you how to make it by following three simple steps. You don’t need any expensive tools. I’m almost positive you have what you need for this tutorial on hand. Best part, you’ll be able to download a free worksheet to start practicing right away. I’ll show how you can have access to it at the end of this blog post. Before we get into the tutorial, let’s start by defining Faux Calligraphy. “Faux” means made in imitation, false, fake. So basically, Faux Calligraphy is fake calligraphy. 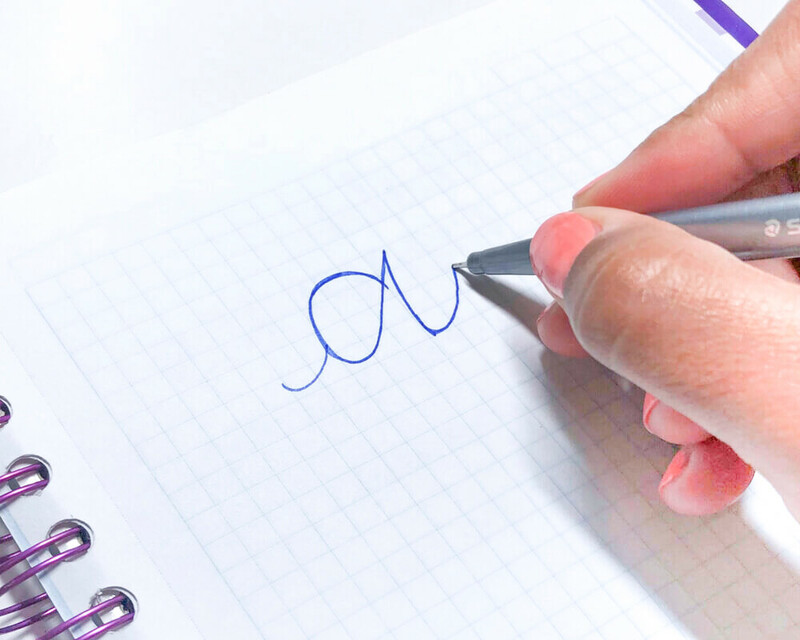 You can create it with any standard writing instrument like a pencil, pen, chalk, or marker. Faux Calligraphy gives you the characteristics of the pointed pen or brush pen calligraphy by imitating the letter shapes and stroke contrast. Fake it till you make it, right? The truth is, calligraphy can be intimidating. You can become frustrated with it if you don’t learn it the right way. I wish I’d known the proper way to do faux calligraphy before I tried modern calligraphy. It’d have saved me a lot of time and frustration. Faux Calligraphy gives you a soft approach to modern calligraphy. Faux Calligraphy offers an alternative way of doing calligraphy on nearly every surface. You can practice Faux Calligraphy at any time. I wrote a blog post explaining these reasons, and you can read more about here. Optional (but highly suggested): a Faux Calligraphy Practice Worksheet. I have a free worksheet you can access from my resource library. You can get access to it by filling the form at the bottom of this blog post. UPDATE: 03/06/2019 – I made a video to show you the tutorial! I’m SO excited and equally terrified because this is my FIRST YouTube video EVER! I filmed and edited it myself on a new program. I believe there is much room for improvement with this video. Don’t forget to fill out the form at the end of this blog post, so you can get access to the FREE calligraphy worksheet that I’m using on this video. Any writing tool will do, a pencil, chalk, or even a crayon. Grab whatever works better for you and the surface you are planning to write on. In this case, I’m using a blue Staedtler triplus fineliner. This pen is my ALL time favorite pen to write daily! Once you have the tools above, follow the steps below to create start creating faux calligraphy! Step 1: Write the letter (s) or word. Step 2: Draw outlines to the downstrokes*. *But, what is a downstroke? A downstroke in calligraphy is when you move your pen downward. 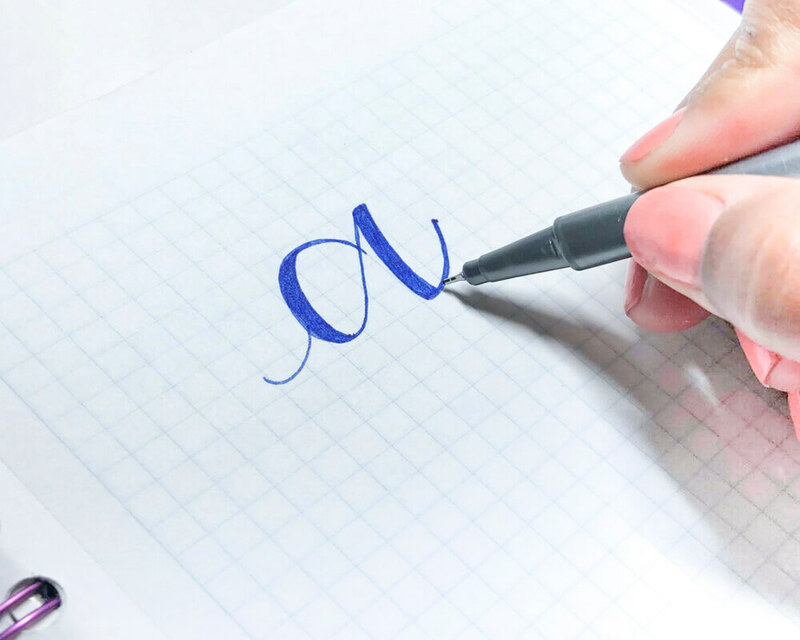 The way you determine the downstrokes is by paying attention to how you move the pen as you are making the letters. Every time you move the pen downward, that’s a downstroke. Pro Tip: There is no rule on which side of the letter you do the outline. I usually like to outline the inside of the letter for the oval part and the outside for the vertical downstrokes. But there are occasions where I have to mix it up. Keep in mind; the GOAL is to create consistency with your letters. Step 3: Fill in the outlines! In this step, you can get creative with your Faux Calligraphy. You can fill in the outlines with a different color, lines, dots, or even leave them blank. It’s entirely up to you! That’s it! 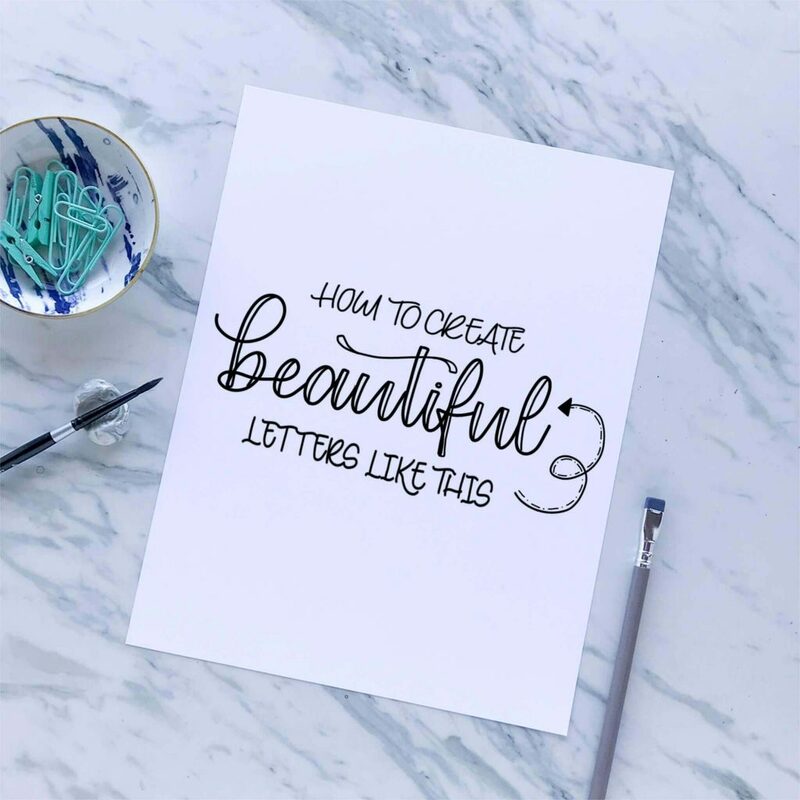 Those are the three easy steps you need to follow to create Faux Calligraphy. You can follow these same steps to complete the whole alphabet, any word or phrase you’d like to write. Below is the lowercase alphabet I did. 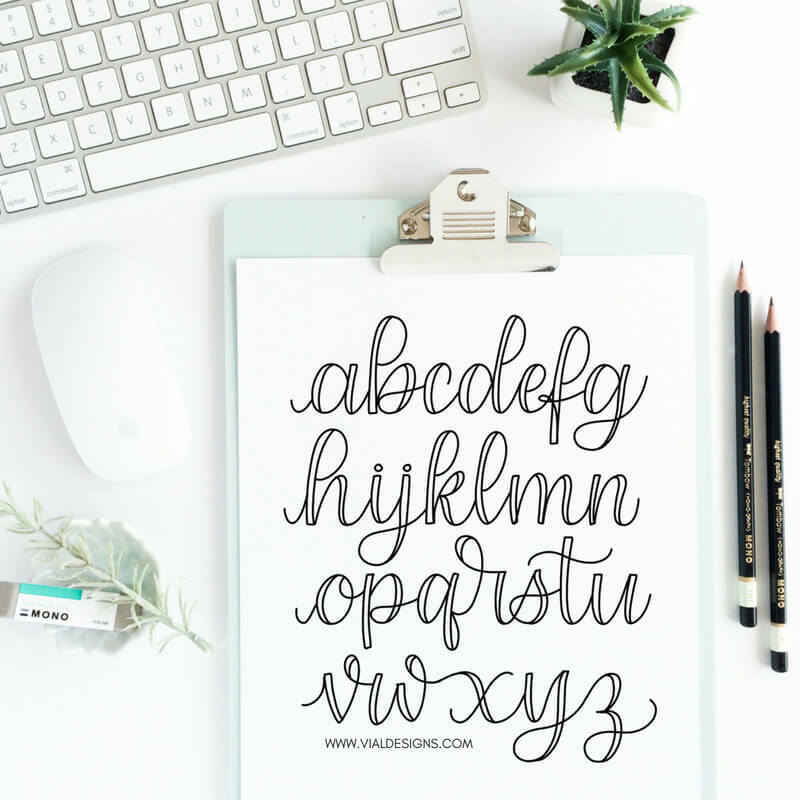 I also created a Free Faux Calligraphy Practice Worksheet you can access by filling the form at the end of this post. Now you can get going with your practice! Remember that learning calligraphy is part of a process. You are acquiring a new skill. Learning Faux Calligraphy first will help you make that process better. But you do need to practice to become better at it! The next step in your calligraphy journey is to get the tools you need to get started. 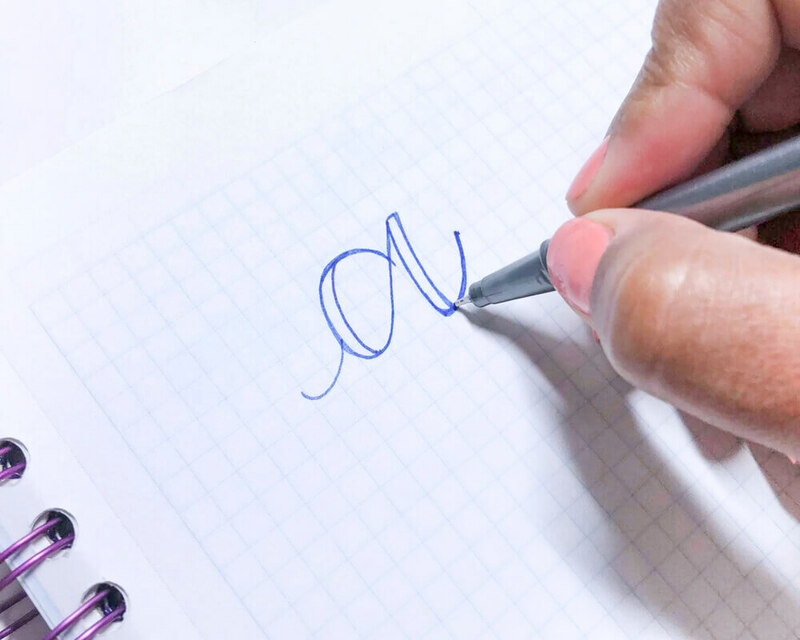 In this blog post, I share everything you need to get started with pointed pen calligraphy. In this other blog post, I go over the best calligraphy brush pens to get started with brush pen calligraphy. I hope you find this tutorial helpful and you start creating calligraphy today! 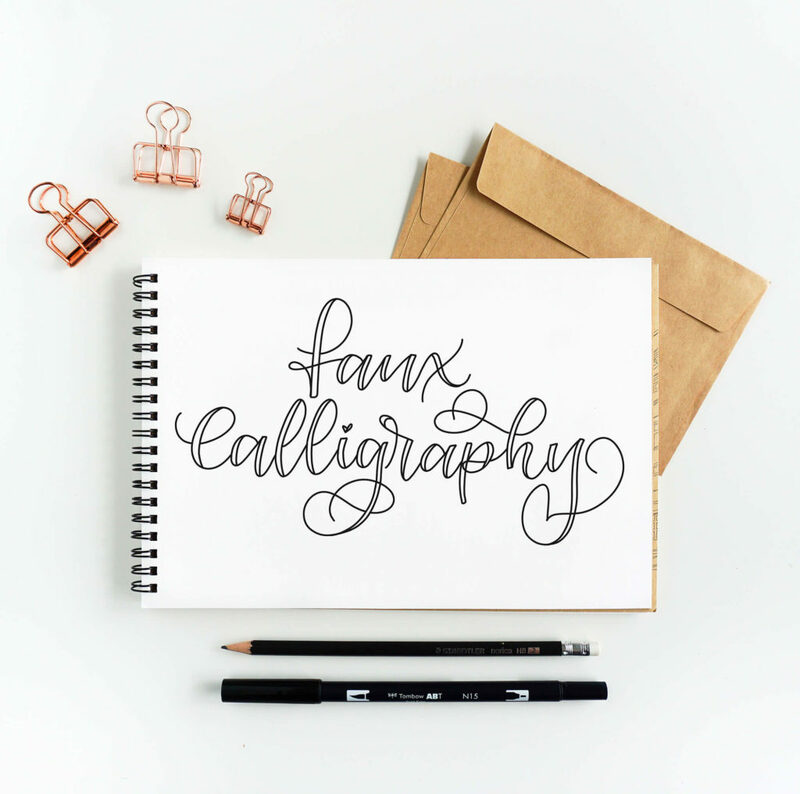 I’d love to see what you create and how you use your Faux Calligraphy Practice Worksheet. Use the hashtag #vd_tutorials or #vialdesigns_blog. Don’t forget to tag me on @VialDesigns (on Instagram) so I can see your work. WANT TO REMEMBER THIS FOR LATER? SAVE THIS FAUX CALLIGRAPHY TUTORIAL TO YOUR FAVORITE DIY PINTEREST BOARD! This is a great way of learning hand lettering Maira! Simple and easy to follow for any beginner. Love the post, am going to try it out today!